'5 Flights Up' follows a dynamic duo that must decide whether or not to sell their Brooklyn apartment of 40 years. Couple, Ruth and Alex have to contend with eccentric open house guests, their pushy realtor niece, and the health of their beloved family dog - all while navigating a New York on edge from what turns out to be a media-generated frenzy. 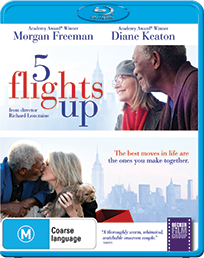 A wise comedy about life, love, and real estate, '5 Flights Up' stars Academy Award winners Diane Keaton and Morgan Freeman as a couple whose attempts at relocation send them on an urban odyssey - and help them redefine the meaning of home. The '5 Flights Up' competition has now closed. Winners will be announced shortly. Competition opens at 5pm AEDT on Sunday 13th December 2015 and closes at 11:59pm AEDT on Sunday 20th December 2015. Five winners will be chosen at random on Monday 21st December 2015. To successfully win, entrants must fulfil the above entry conditions before the time the competition closes. Current members/followers are eligible to enter the competition. Only one entry per person. Only one winner per household. To be a valid winner, the entrant must not have won a prize from SWITCH within the last 28 days. Each winner will receive one Blu-ray copy of '5 Flights Up'. By entering, you agree to receive occasional emails from SWITCH in the future. If you decide to unsubscribe from these updates, any further entries will not be applicable. Only Australian residents are eligible to enter. '5 Flights Up' is available on Blu-ray, Digital and DVD on Wednesday the 16th December 2015 from Becker Film Group.